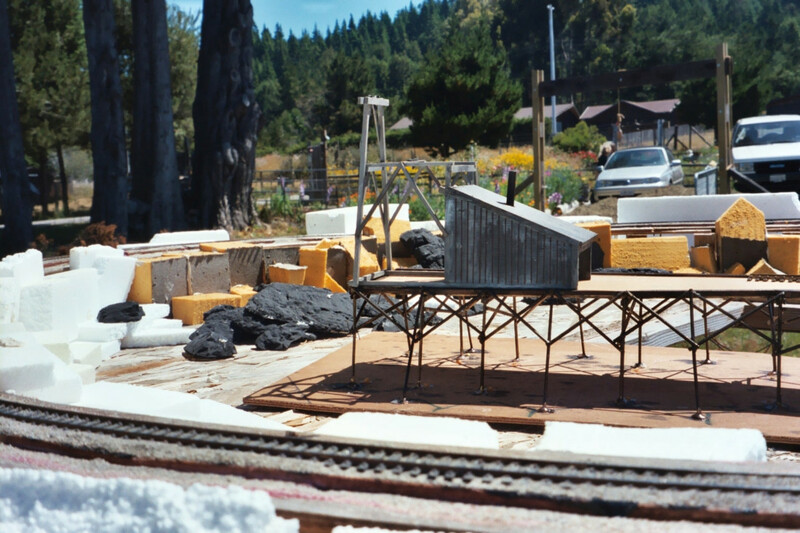 Nn3 is narrow gauge in N scale, primarily, but not exclusively using Z scale standards to represent 3ft narrow gauge railroads.While it’s obviously a minority interest, it’s followed by an increasing number of modellers worldwide. 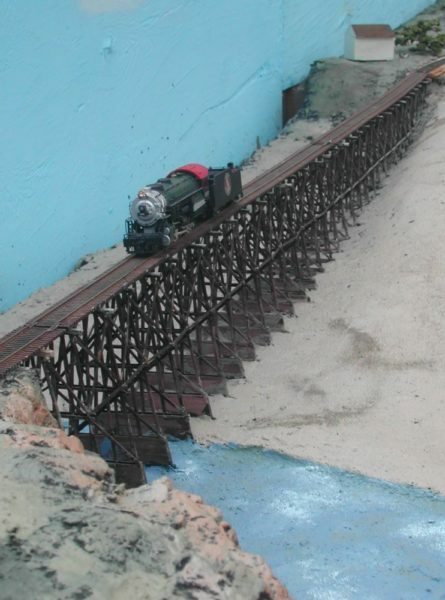 N scale uses 9mm track. 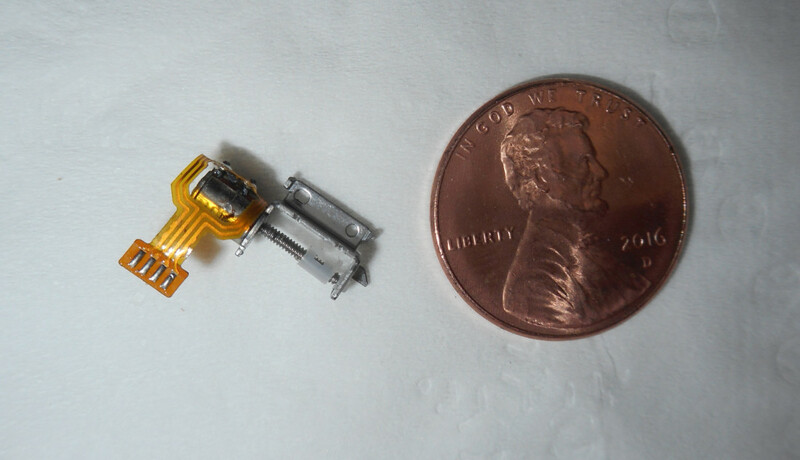 Z scale use 6.5mm. 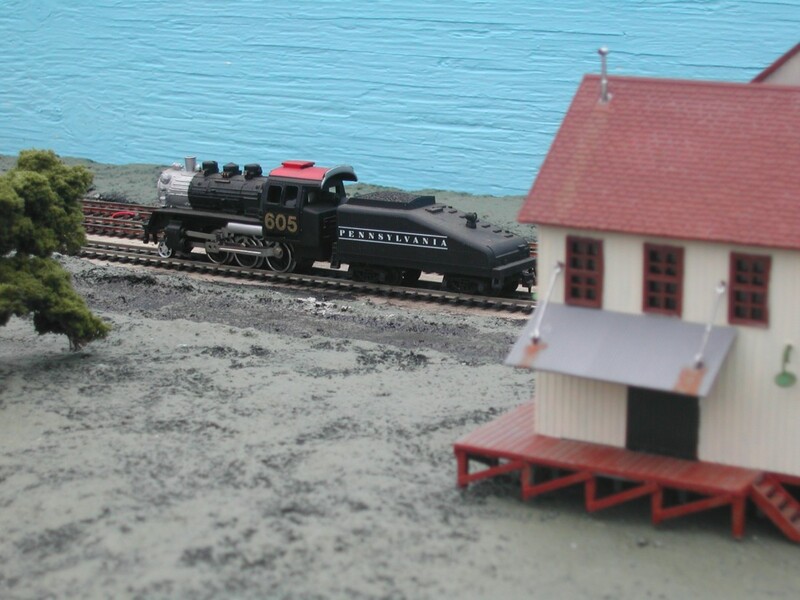 So, Nn3 is N scale rolling stock on Z scale track. In other words VERY small. Stepper motors-The stepper motor is an electromagnetic device that converts digital pulses into mechanical shaft rotation. Advantages of step motors are low cost, high reliability, high torque at low speeds and a simple, rugged construction that operates in almost any environment. Ok, you got your mind around that. That’s Joe’s finger in the pic. 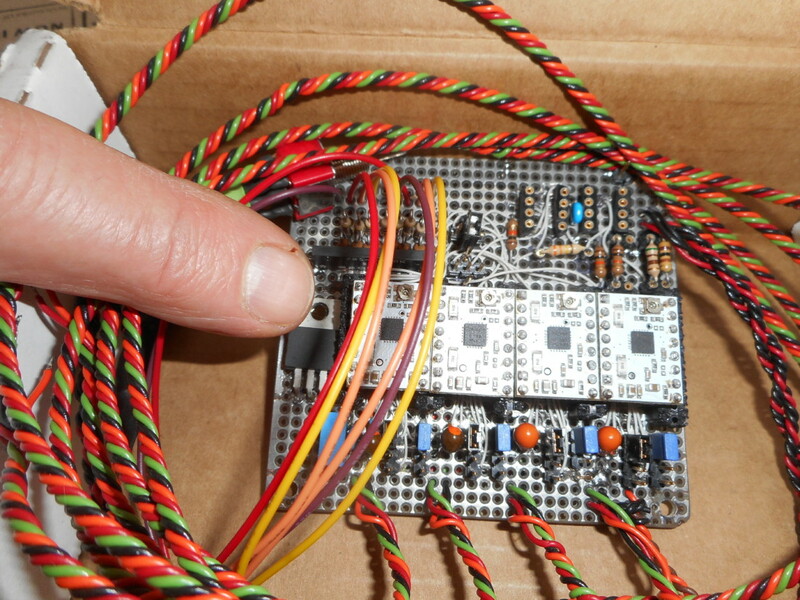 And, he did all the soldering. 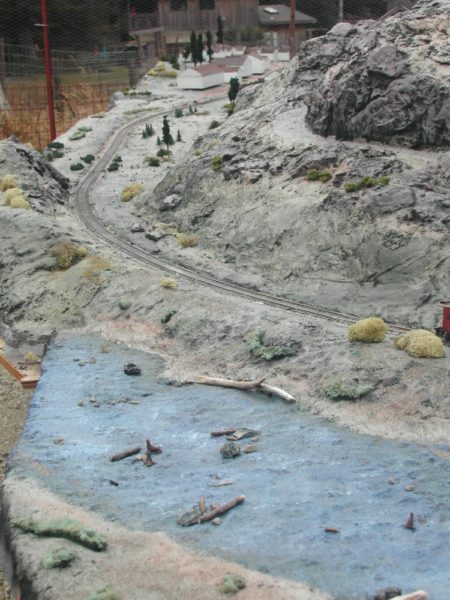 This series of posts is about the second MCMR&HS HO layout. MCMR&HS is the Mendocino Coast Model Railroad & Historical Society. 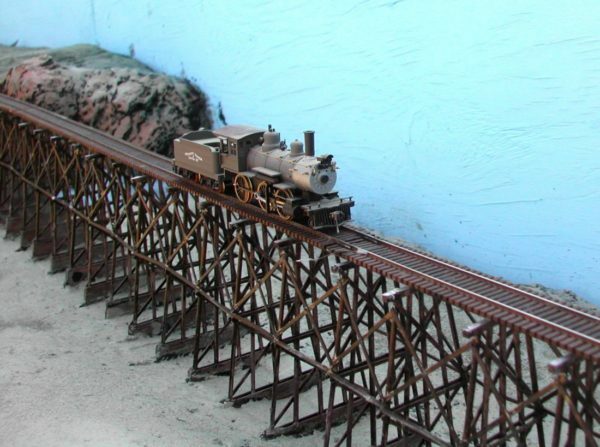 After the train show described in previous posts I was asked to write a report to club members about what I/we had learned from building an outdoor HO layout. 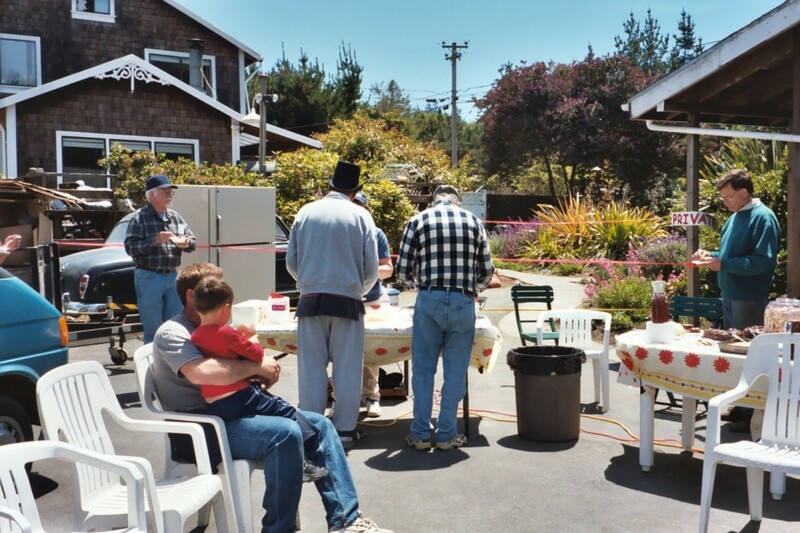 In 2003 there were very few computers so there was no e-mail among club members. This is my written report. 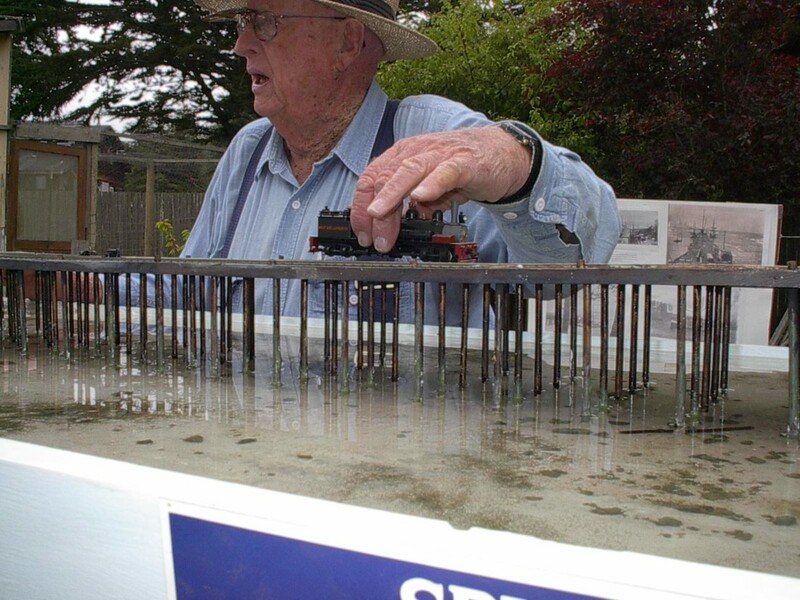 you should look at a model railway not down on it. 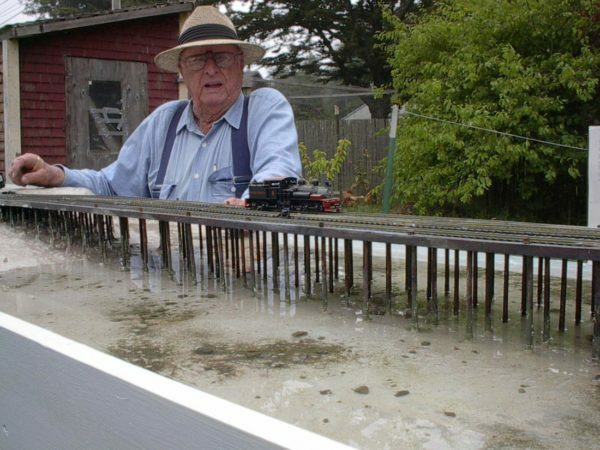 So, I set the 10 mile sea-level at 3 feet 9 inches which meant that Fort Bragg (when completed) will be 4 feet 3 inches as it is 45 feet above sea-level. sound really adds to the realism. Joe advocated installing on-board sound which, I agree is very effective indoors where the sound is contained. Alas, it is also expensive so I settled for an inexpensive “out board” system as it can be cranked up to “mystify” the neighbours. 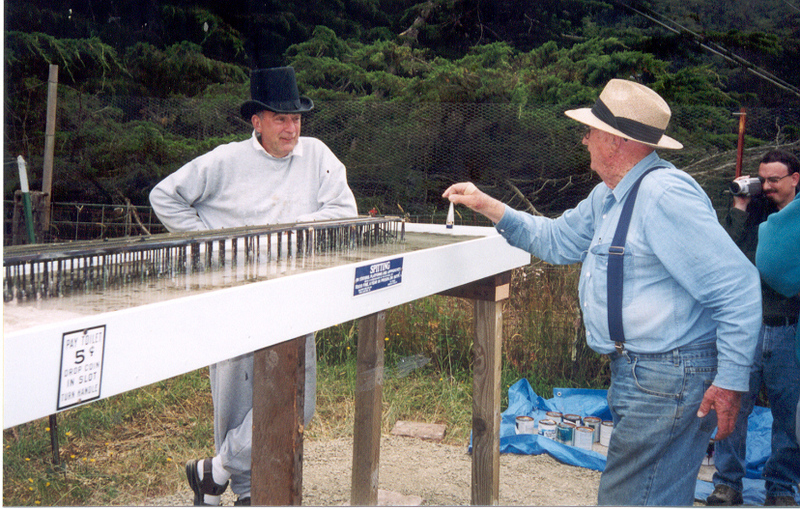 Use a device to show people scale …… in this case it’s easy ‘cos everyone “knows” the Pudding Creek Trestle. make every switch manual ….. keep the electrics to the minimum …. we live by the sea and salt air is murder on electrics ….. add to that I think it is neat to throw the switches yourself just as in real life. Wire every section of track from a bus (a pair of wires running the length of the track) so you don’t have to rely on the rail joiners to carry the electric current.I reinforced the nine main fence posts last November (2002) with 3 bags of post mix each to stiffen them up. During the winter I started scrounging materials. 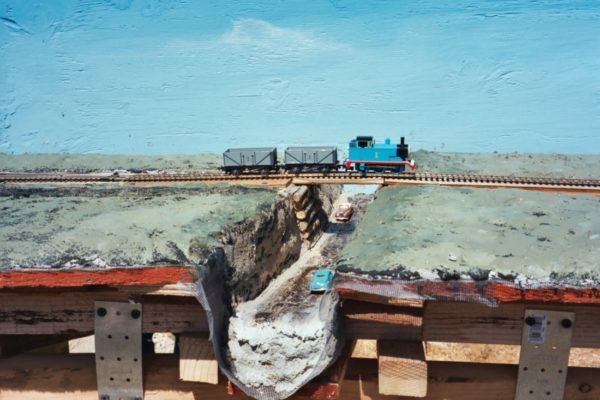 Now keep in mind that in 32 years of being a model train enthusiast I have NEVER completed one itsy bitsy layout. On March 9th construction began. The plan, like all good plans, didn’t survive after contact with the enemy, The layout is currently about 135 feet long …..about 2 and a bit scale miles (vs 9. something in real life) …… it takes about 7 minutes to traverse the layout if the top speed of 12 miles an hour is observed (12 was the max in real life). 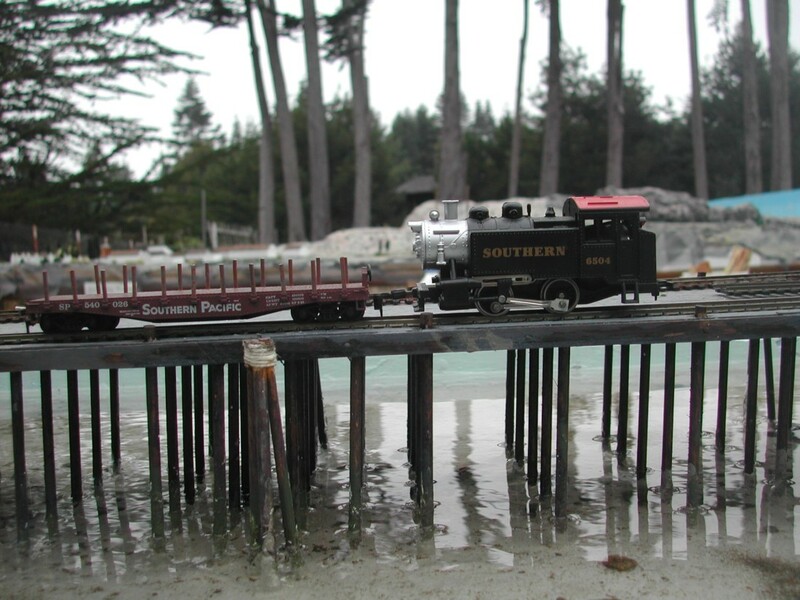 The path of the railroad contains 12 tons 435 pounds and 4 ounces of rock and took 162 wheelbarrow loads to move. That’s about the limit of my record-keeping. 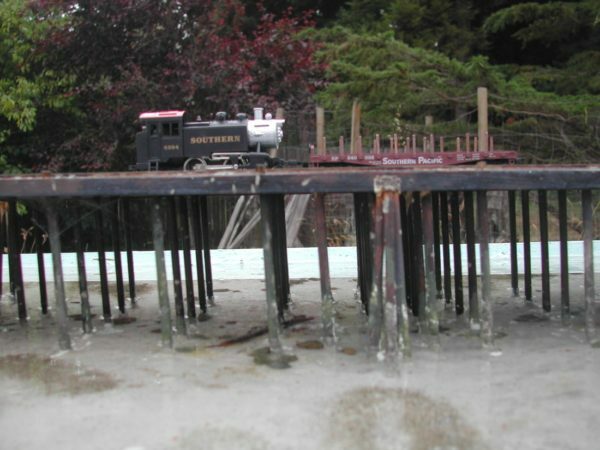 I have kept the trestles to scale …. 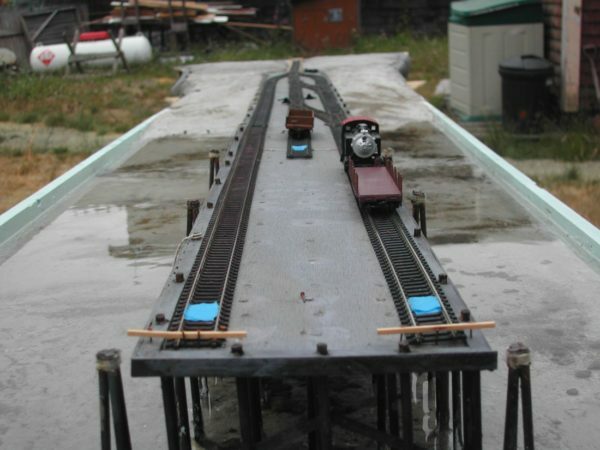 The curve at 10 mile river is 10 degrees just as in real life. What have I learned so far …..
A clear vision is not the same thing as a short distance. 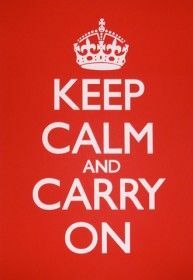 Expect the worst and that’s what you’ll get … except it’ll be worse. Things got better after I abandoned hope. Hot glue really is hot …. Like it leaves a huge blister. Einstein may be right about genius …. 99 per cent perspiration and 1 per cent inspiration. 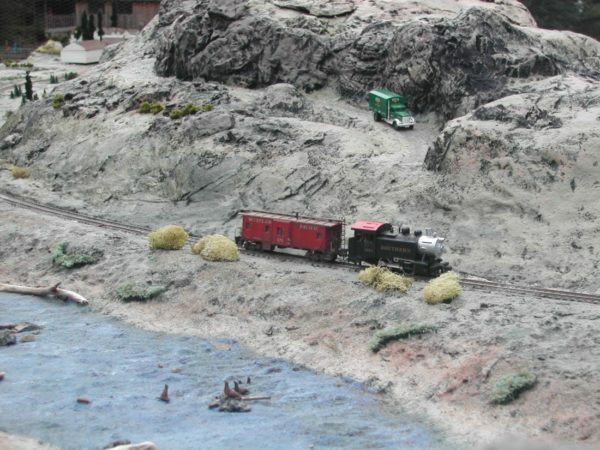 Model railroading is 100 per cent perspiration. Concrete is REALLY heavy. Concrete cracks. You can drill a hole in your finger. The next steps: If I keep at it I should more or less finish what you see by this fall. Next I want to connect the ULC pier to the main layout by adding Fort Bragg and the downtown wye so there is a “logical” thing for the train to do …. bring logs from Camp 1 and take the lumber out to the pier. I’d like to add the wye that existed at Camp 1 so the train can turn around. What actually happened? Pretty much nothing. My wife and I were asked to run the Ice Cream Concession in the local Gardens and that’s where we spent the next eleven summers. The layout became so dilapidated that it was torn down. VERY sad. I had great fun building it. Posted in Member layouts, Our Layout. Taking on killer chilli. That’s me and club pres Phil Miller at the trough. 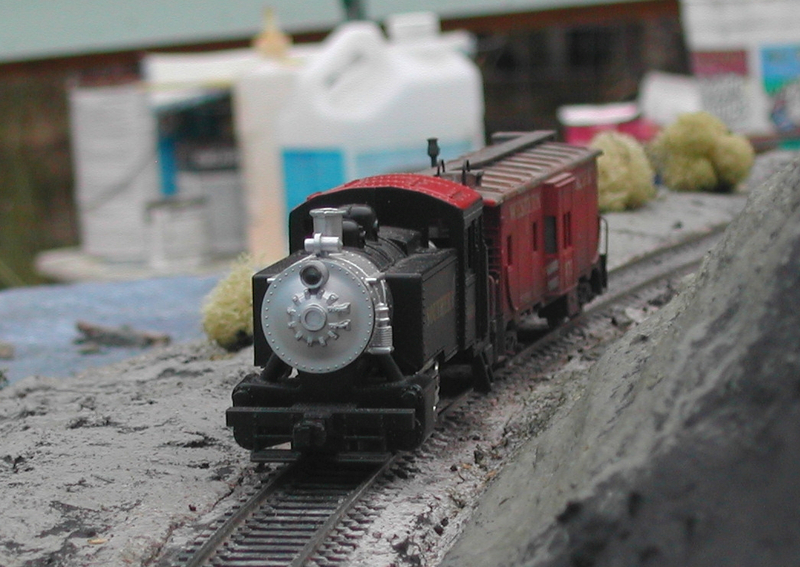 The women seemed content to gab, ignore the train and wander in Sarah’s garden. The garden on train day. 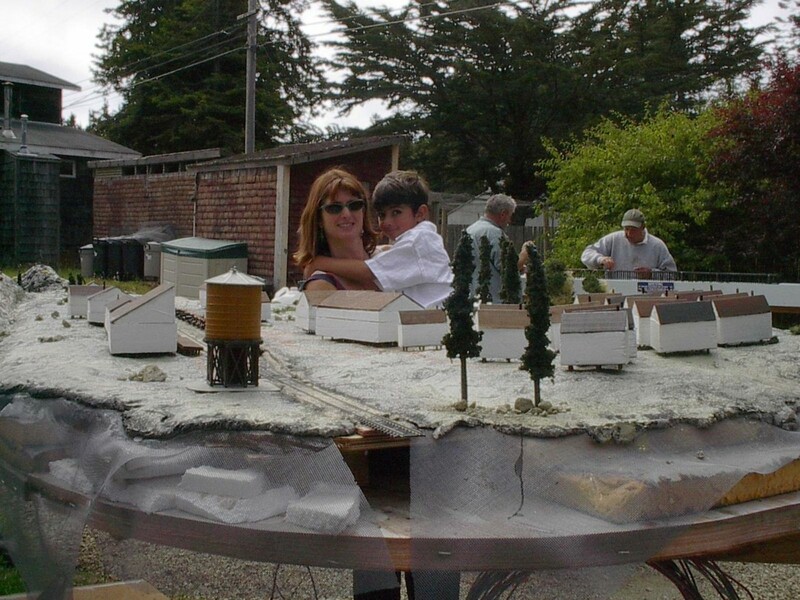 This series of posts are about our club’s (the Mendocino Coast Model Railroad & Historical Society – the MCMR&HS) second layout which was built in the lower field of our house in Inglenook – 5 miles north of Fort Bragg, CA. 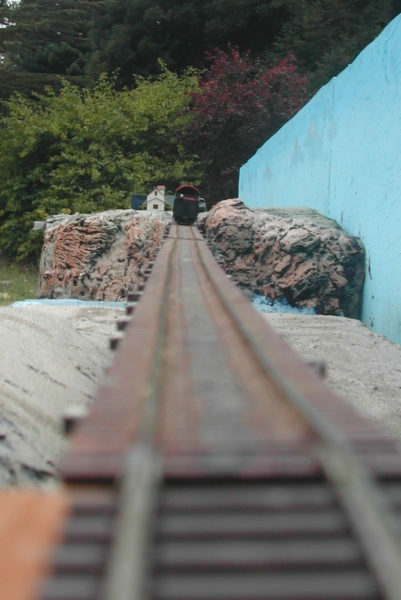 Previous blogs detail how I/we got to opening the layout on July 6th, 2003. The layout was huge and there was no time to scenic it all before Train day. As a result I had to pick and choose what got scenicked and what didn’t. 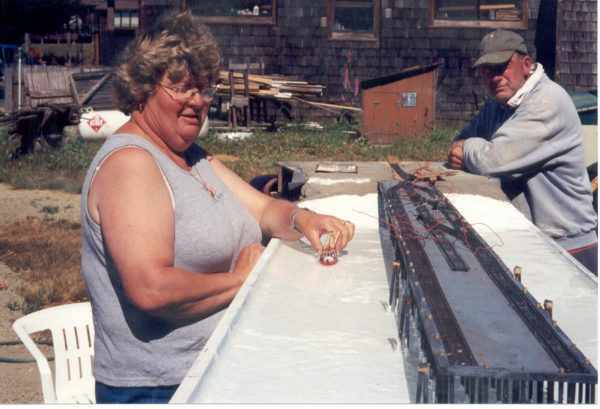 I was enamored with the ideas of using concrete so having evaluated what I could build I decided that a bit of the Ten Mile River, the road that led down to it and the relatively close Camp 1 of the Union Lumber Company (ULC) was the way to go. To get to the bridge from the south you have to go down a steep road. 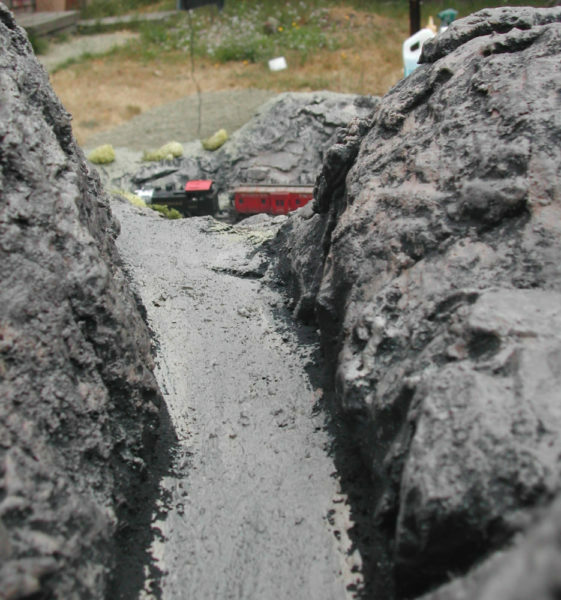 That steep road was the subject of my first concrete diorama. 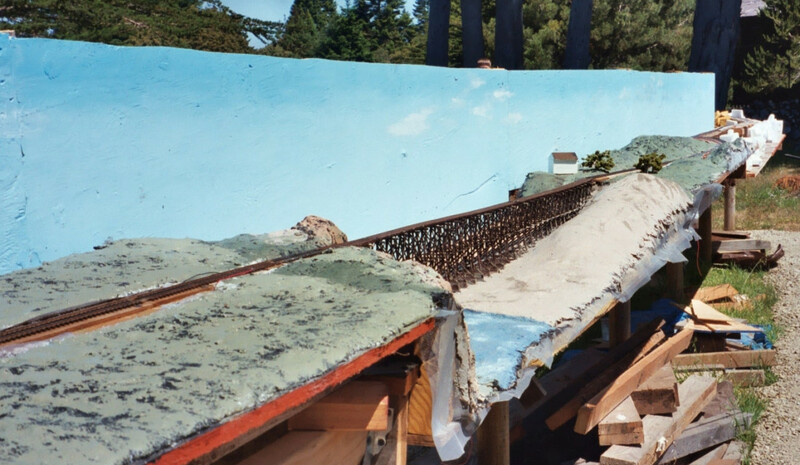 The concrete was supported by a mess of scrap wood from the re-model of the house. 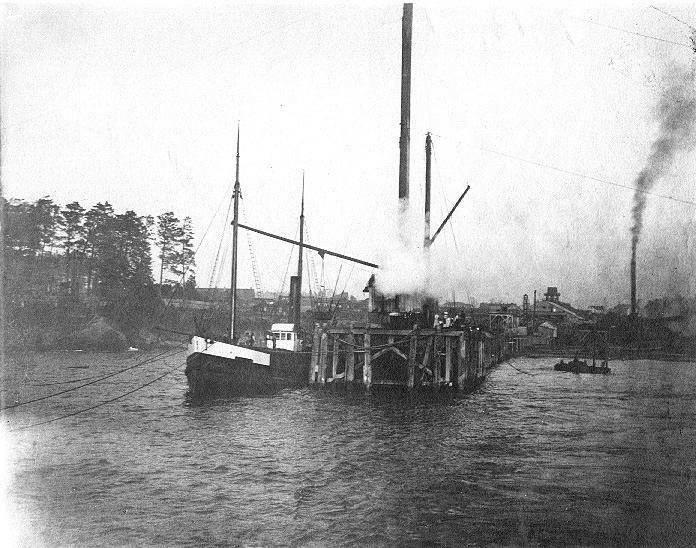 Joe Duviviers brass engine passing 10 mile river. The road to the bridge is behind the railroad tracks. If you squint and look at the objects in the river you’ll see they are seals. Camp 1 was the base camp for the 42 camps that the ULC used to log the Ten Mile River basin. 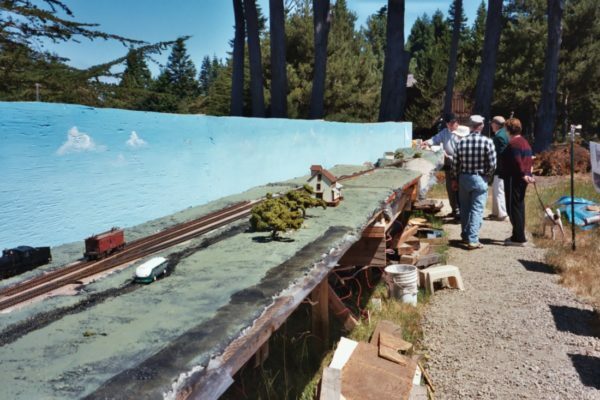 Bring your own HO Loco and with a little bit of luck run it from Rossi’s to Camp One on 2.5 scale miles of HO track over 5 trestles built to scale. See the Cleone Tramway. Free Tea and Stickies plus Killer Chili plus Added Attractions …..
Bob (the Builder) Taylor will be trying to incinerate Tony’s workshop running a LIVE STEAM G Scale engine indoors …. 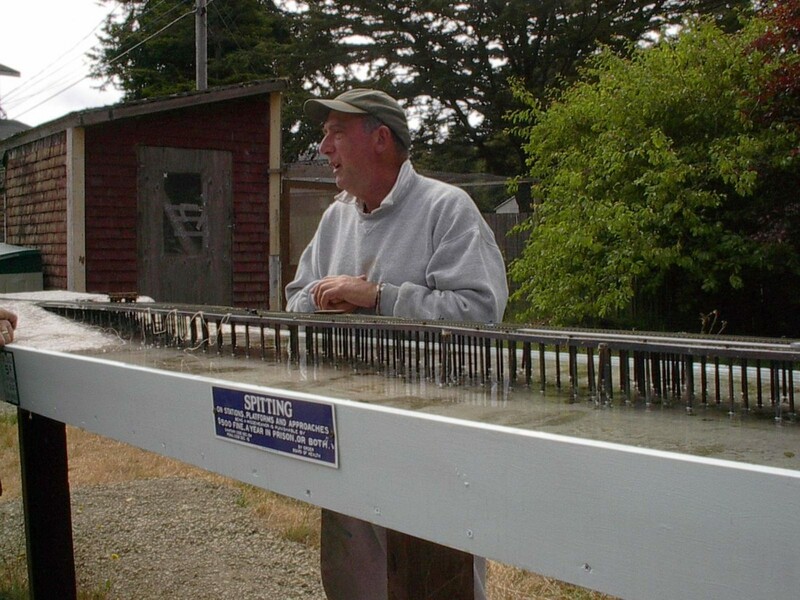 His wife, Virginia will demo how SHE caught a 43lb salmon. 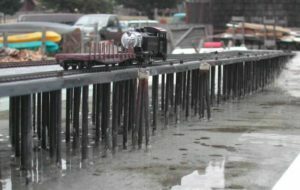 Colin Menzies world class (as seen in Timber Times) static steam models will be on display. You are welcome to bring husbands, wives, girlfriends, boyfriends, significant others, POSSLQs, friends (no enemies please) as well as dogs, parrots, elephants and children. Tony’s wife and landowner, Soggy Foggy and daughter CTP own 2 very large (as in 115lbs and 85lbs) grossly stupid dogs named Charlie Brown and Buddy as well as a larynx on four legs which means the site of the railroad has MANY doggy landmines and multitudinous attempts by aforementioned canines to reach others of the same gene pool located in or near the Nullarbor Plain which they have artfully camouflaged in an attempt to have you break your neck …… PLEASE be CAREFUL of the HOLES ….. you ENTER the Dead Chicken Ranch at YOUR OWN RISK. 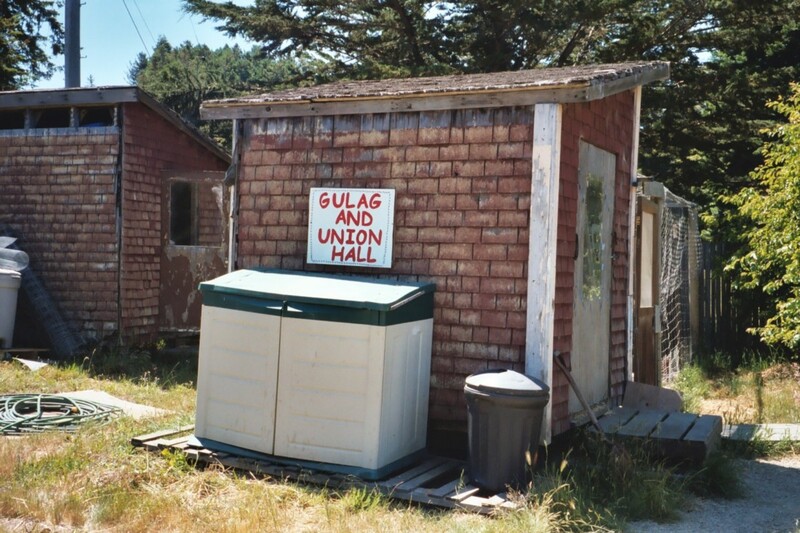 Adjacent to the railroad is a gulag wherein which reside 11 domesticated vultures. APPROACH AT YOUR OWN RISK. These pigs with feathers are direct descendants from Attila the Hun’s own. They are NOT related to the nice Mrs Cluck in children’s books. They are a highly organized trade union headed by chief shop steward ‘ermione who was trained in guerilla warfare by Ho Chi. She is assisted by ‘ester who recently returned from a training camp in Afghanistan. I retrieve the few oeufs they deign to produce dressed in a pith helmet, goggles, leather gloves, steel capped boots and a reinforced steel box to protect one’s private parts holding a dustbin lid and I have still suffered grievous wounds. YOU Are WARNED. The Grange (about 200 yards past Simpson Road) serves a GREAT breakfast for $5 on the first Sunday of the month if you want to feed your face before you have a giggle seeing what Tony has created to date with great help from soldering genius Hank, MUCH advice from train club members in particular Phil and Bill, materials donated by the Pyeatt family at the Floor Store, artistic direction by Ute, and construction erudition from Brian. I was up early July 6, 2003 (a brilliantly sunny, warm summer’s day) putting out signs and doing those last-minute things. Sarah was busy making a huge pot of chili. How many would come was the BIG question. The answer was, “quite a lot.” Enough indeed, to scarf all the chili by 11:15! 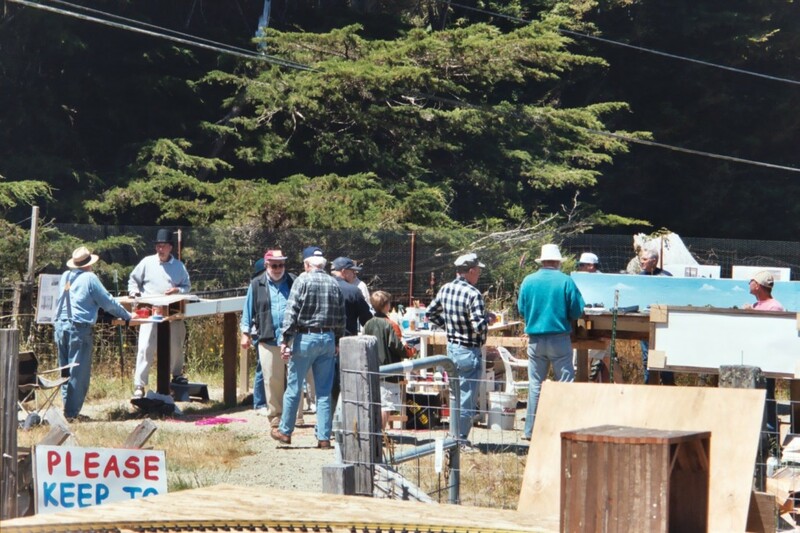 This series of blogs are part of my efforts to document the history of our club (The Mendocino Coast Model Railroad & Historical Society – the MCMR&HS). 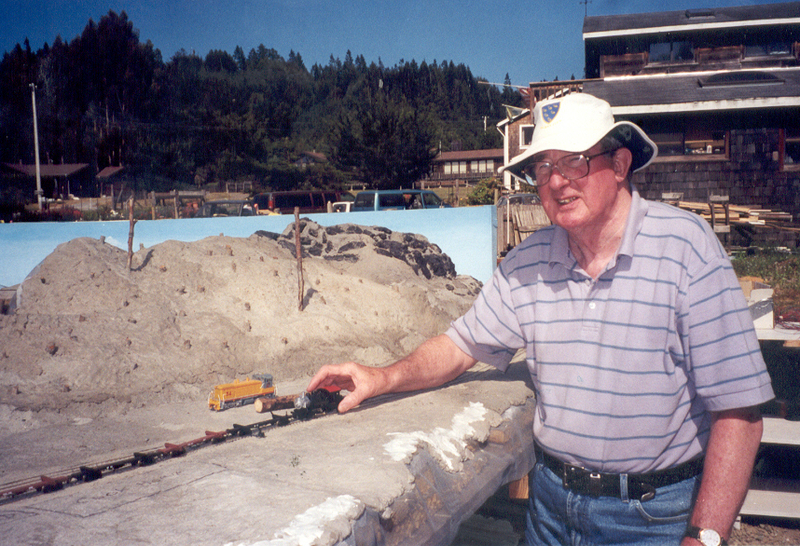 The construction and running of the HO Ten Mile Branch all took place in 2002 and 2003. 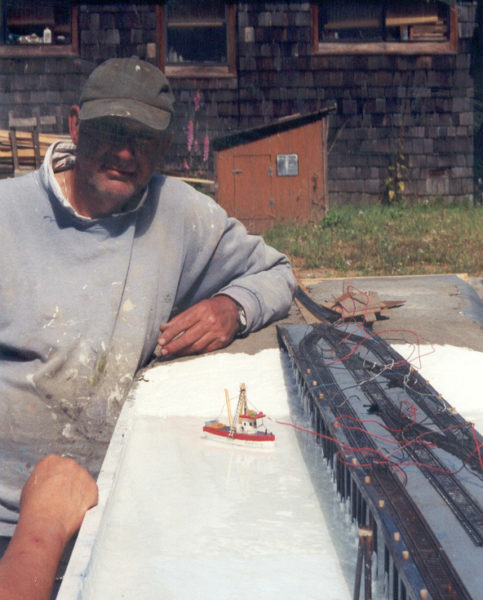 The last post detailed the misadventures of building a prototypically accurate HO model of the ULC (Union Lumber Company) pier which jutted out some 670 feet into Soldier Bay here in Fort Bragg. My consultant on the pier construction was my very good friend Hank Simonson. 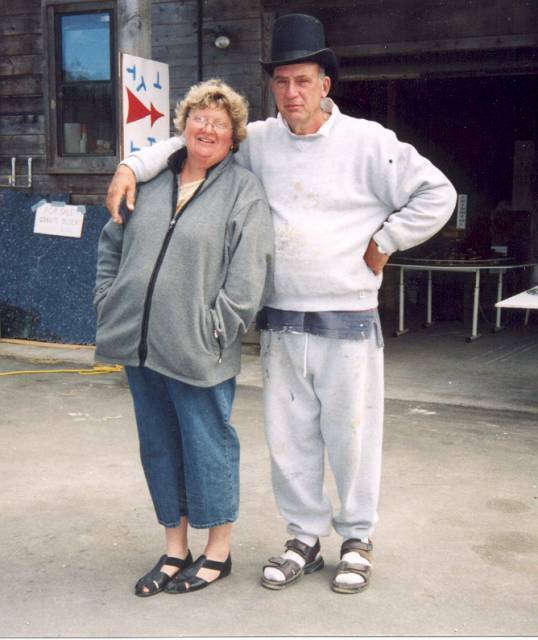 In one of our many planning sessions – Hank’s wife Flo called them extended coffee breaks – Hank told me that he and a friend, with the full permission of the mill supervisor refurbished a small sailing boat named the Stubby II they acquired from the ULC on ULC Mill property. The ULC superintendent encouraged the “boys” and offered materials from ULC stores, as well as advice and encouragement. 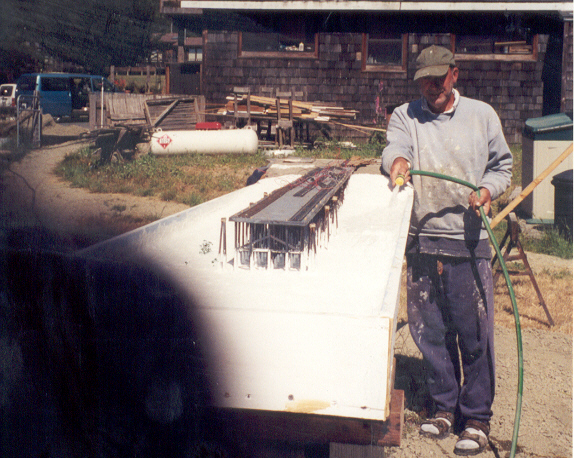 The gas tank for the boat was salvaged from the bottom of Elm Street, now known as Glass Beach. 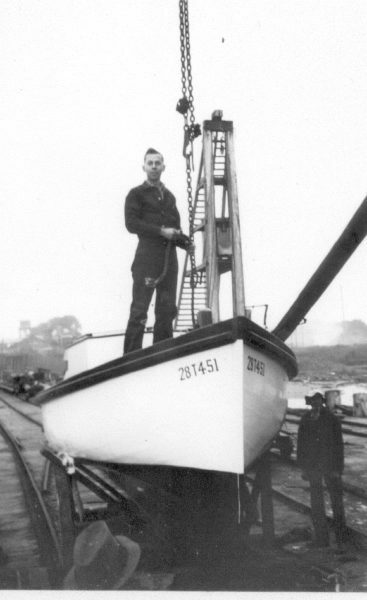 There are cliffs all around the Mill site and the only way to launch Hank’s Stubby II was off the ULC pier. 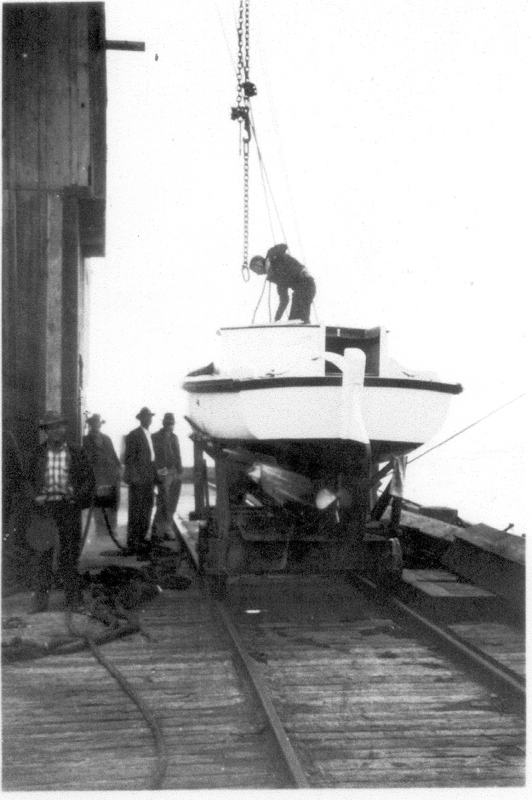 In 1939 demolition of the pier was kindly held up until the “boys” finished and then Stubby II was lifted off the pier into the water. Unbeknownst to Hank I asked Flo if there were any photos of the Stubby II and if so could I borrow them without Hank knowing. Flo produced two of the Stubby II being launched from the ULC pier. 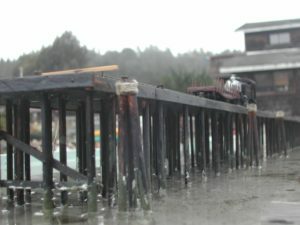 The wires on top of the pier are for the to and fro mechanism Hank installed on the pier. Hank was tickled pink. 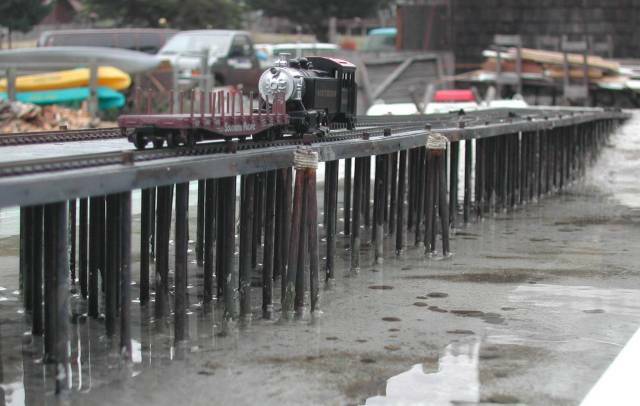 Hank decided to perform the launch at the deep end before all the water ran out. Hank kept the Stubby III in pride of place on top of his home computer. 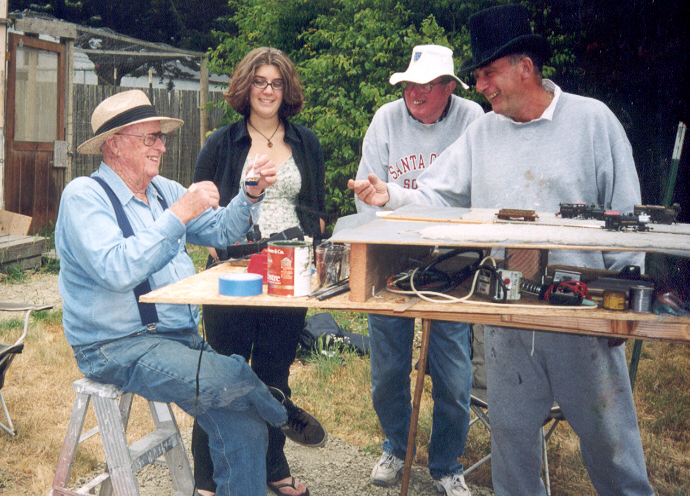 More about July 6th 2003 in the next post. Hank Simonson and I used to sit in his garage and pontificate on the state of the world whilst we were feted by his wonderful wife Flo with coffee and delicious cookies. 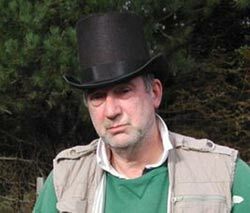 Our ideas, designs and plans, both practical an outrageous whiled away many a pleasant hour. 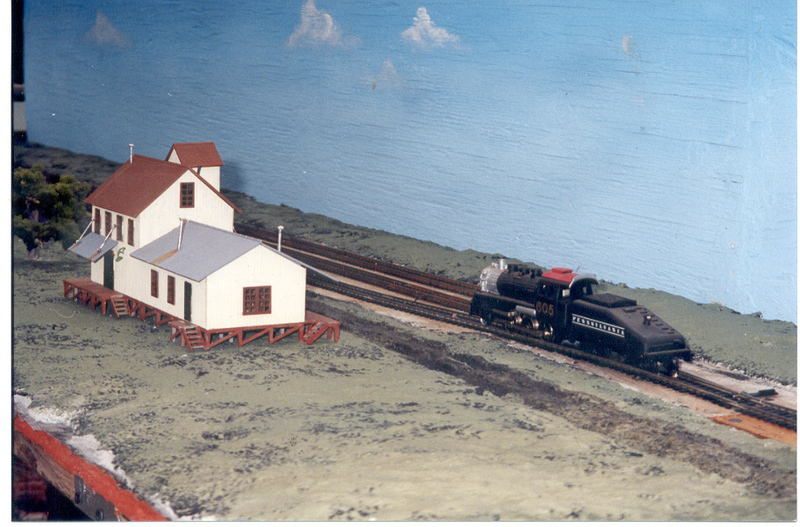 One design, “The Ain’t Goin’ Nowhere layout” still exists. I appointed him consultant extraordinaire for the Ten Mile Branch. Now comes a very sad part of this post. Make sure you have tissues to hand. In order to obviate the same level of disaster I had building the Little Valley Tramway (see previous post) Hank and I agreed that I should build the pier upside down. This worked well and we got the track and decking looking pretty real. Next I built the pilings and attached them to the decking. Voila, I had a six foot long pier. Hank and I agreed that to make it look authentic it should stand in the sea. No prob, right? I built a rectangular box of 1″ by 8″ on a sheet of 1/2″ plywood. This I mounted on four 4″ by 4″ Here’s the pier in the box. I painted the inside of the box and caulked the seams. Then I put in water. It leaked like a sieve. Not only did it leak but there was no seabed and shore . My trusty consultant and I agreed that the answer was concrete. I mixed up two 60 pound bags and it went nowhere. So, I got two more. Still didn’t look right. So I got two more. Better, but not great. So I put in two more bags. It still wasn’t perfect but it was passable. And then I went to bed. Now you geniuses out there have, I am sure, figured out what happened overnight. Under the weight of eight sixty pound bags of concrete the box had undertaken a Titanic size list. With the aid of a buddy and some car jacks I got the bloody thing level again. I reinforced the supports and thought I was home free. Not so. I hadn’t realized that not only had the box listed the 1″ sides had bowed out. I sloshed some more concrete around the edges to fill up the gaps. Next day I poured in water – it leaked like Niagara Falls. My consultant suggested caulk. Well that worked to the extent that it took about three hours for the tide to go out. We decided that we should quit whilst we were ahead by a nose. Hank said it looked ok except that the pier legs needed barnacles. More concrete was applied. 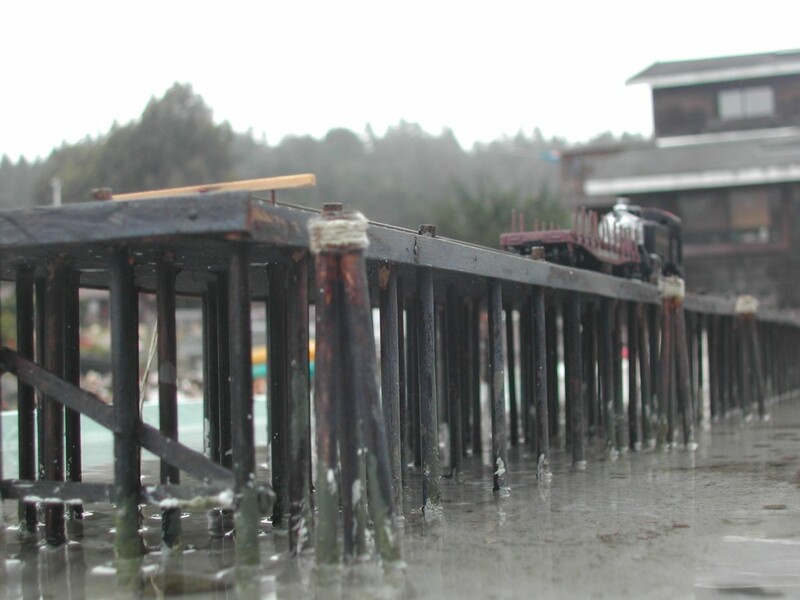 The above pics show the pier being tested. After the test Hank and I posed besides our masterpiece. We never did get it to hold water. 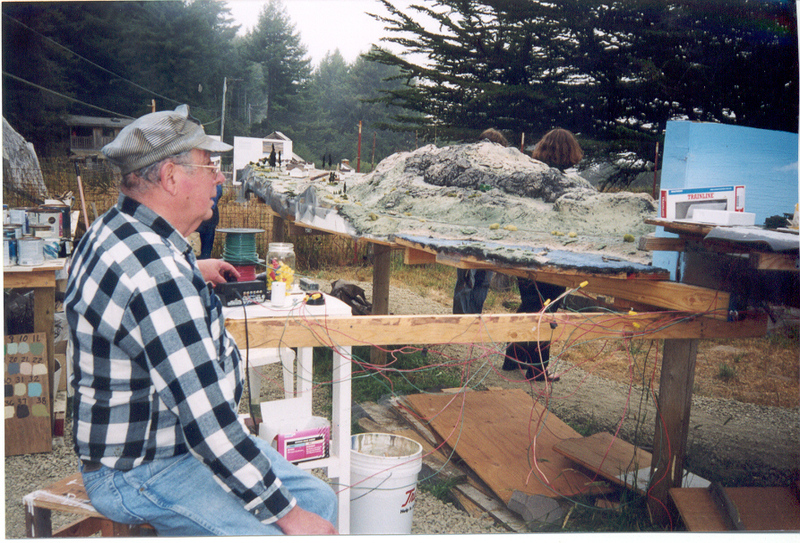 Alas, our ideas for making waves were never tested. Pity. What to build in the space? 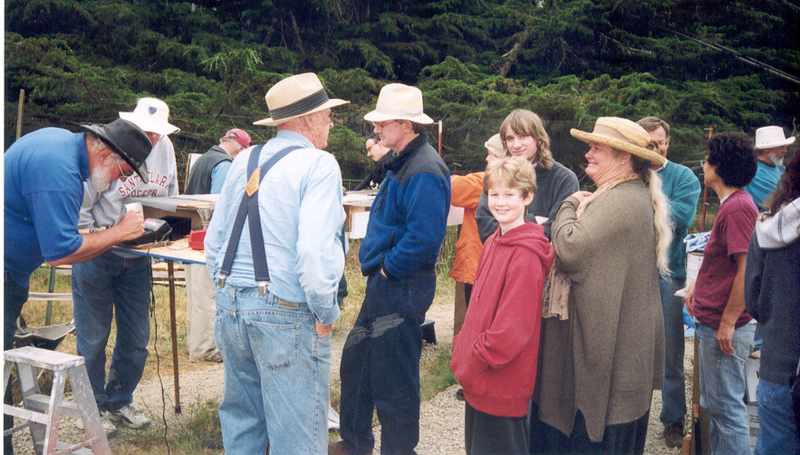 At a club meeting the idea was broached of making the space into what we now know as McKerricher State Park. No prob – masses of concrete and trees. Then someone remembered that there used to be a mill that had a tramway that ran through McKerricher Park. 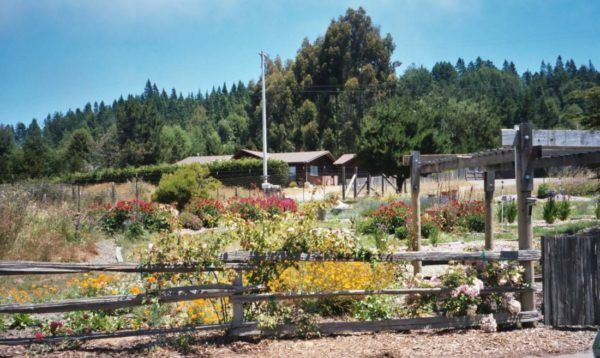 Mckerricher State Park was called Cleone Point in the late 1800’s. 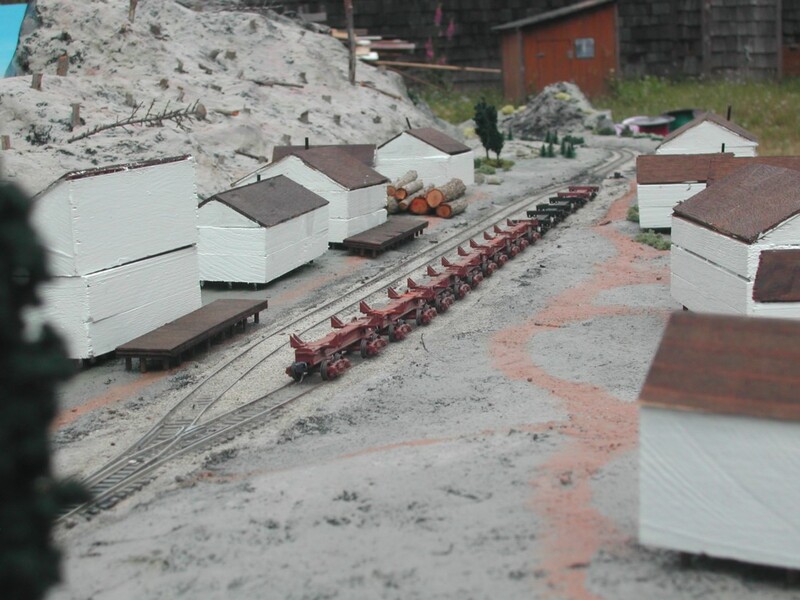 Little Valley Lumber Company built a tramway which ran two and one half miles from their sawmill back on the hill east of Cleone. At the Point was a chute from which lumber and forest products were loaded aboard ships. 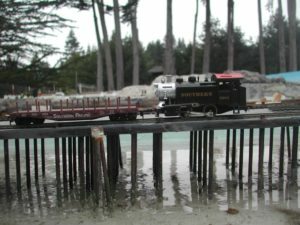 The tramway was unusual because no steam locomotive ever ran on its rails. The rails were wood to which metal straps were spiked. 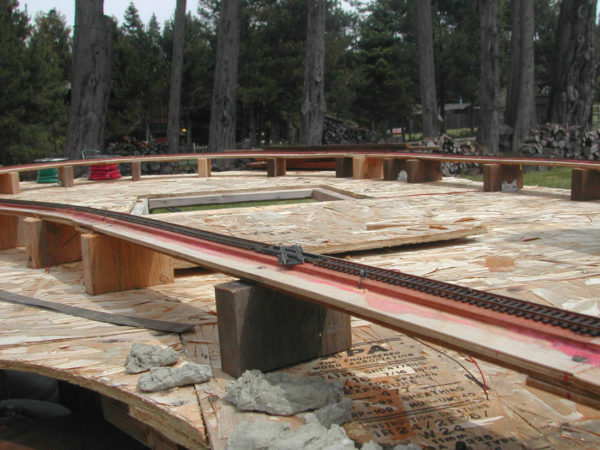 Gravity-propelled cars loaded with lumber or tanbark. 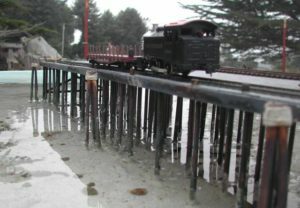 Leaving the mill, a “train” comprised of two to four cars rumbled though downtown Cleone (known then as Laguna). 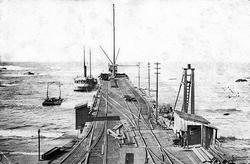 The grade from the mill was sufficient to propel the lumber-laden cars out to the ship loading chute. Horses hauled the empty cars back up to the mill. 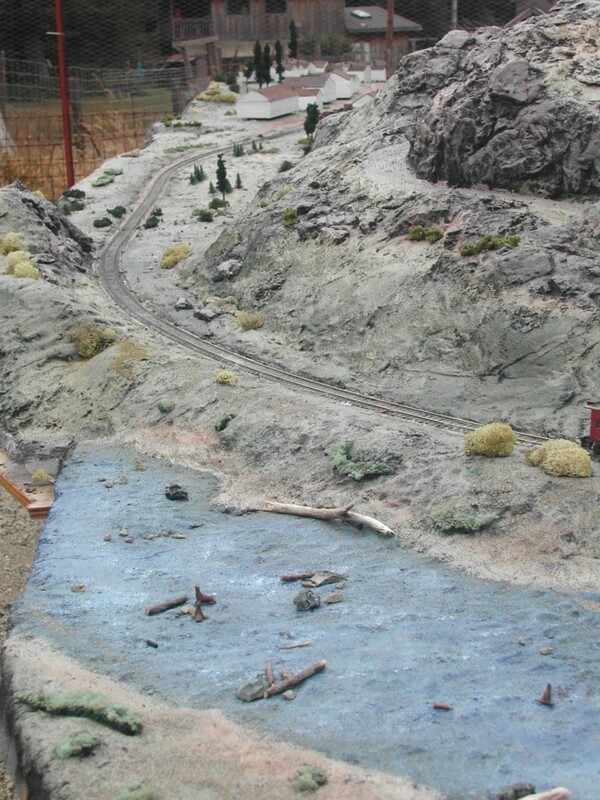 Having made the decision to build the chute some bright spark noted that the tramway never crossed the Ten Mile Branch. The tramway was abandoned before the Ten Mile Branch was conceived. The answer was, poetic licence. Who would know except those that were in the know? As I soon discovered, replicating the spindly pier and chute in HO scale was no easy task. The first version collapsed in a heap of sticks when I accidentally knocked it on the floor in my workshop. The second one was also fragile and I decided it would only appear on high days and holidays. Fortunately you cannot see the great gobs of hot glue that hold the legs to the base!!!!!! !